This week is Holy Week–a time to remember and reflect on the events that led Jesus to the cross and to his resurrection. The time of Lent developed as part of the historical Christian calendar and is typically celebrated by Catholics and some mainline Protestant churches that follow a liturgical calendar. Lent is the most appropriate time to really meditate about Jesus’ Passion. This week, dust off your Bible and discover the words of the Lord. There are Bible verses detailing promises and examples of God’s love and protection. What are your favourite verses? Humble yourselves, therefore, under God’s mighty hand, that he may lift you up in due time. 1 Peter 5:6. Combining religion and summer vacation, the Holy Week is the best time to get that much-needed rest and offer a silent prayer. Bohol is a perfect place for reflection. The paradise will surely make you reflect on the things that you have to be thankful for. Spending the Holy Week on the beach may be frowned upon by conservatives. But it is a personal choice on how one remembers the passion and suffering of Christ. Remember, it is never about a place or location. You can have beach soul-searching in Dauis, Panglao, Anda, Loon, Ubay and Carlos P. Garcia Island. You can sit alone under a beach hut and sip fresh juice, and thank the Lord for all the blessings. 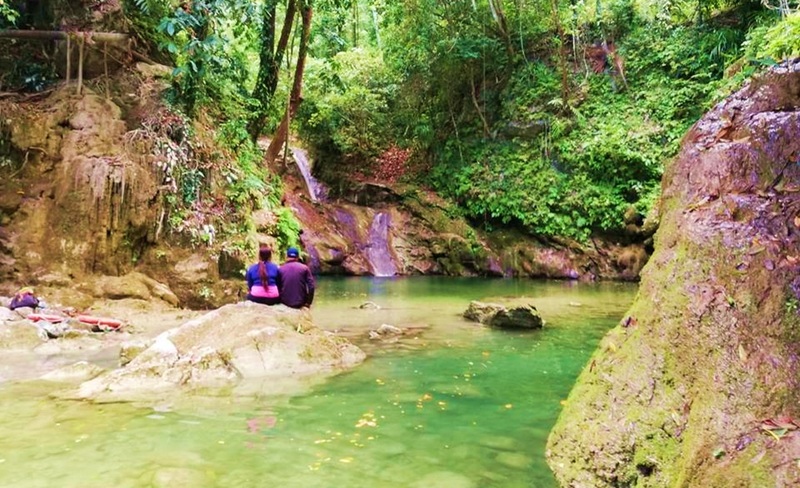 Waterfalls in Balilihan (Camugao Falls), Dimiao (Ingkumhan and Pahangog Twins), Candijay (Can-umatad Falls) offer serenity. These not only feed the soul but also rejuvenate the body. Himuntagaon Hills in Loay and the Alicia Panoramic View are another jaw dropping places for meditation and reflection. Allow these postcard worthy views to bind your faith and restore your religious spirits this Holy Week. The Lenten Procession in Baclayon is a must. During Holy Wednesday and Good Friday, the streets of this town are filled with life-size religious statues depicting key events of the Passion and Death of Christ on decorated carrozas which are solemnly paraded along the streets followed either by devotees reciting the rosary. In Loboc and Loay towns, one can see the ritual that dramatizes the first meeting of Christ and Mary after His resurrection takes place at dawn on Easter Sunday. It begins with two processions, where statues of Christ and Mary are carried from opposite ends of the community. The statue of Mary is covered in a black veil of mourning. Eventually, they will meet at midpoint, during which an angel (typically played by a young girl from the community) will lift the veil, ending Mary’s mourning and Holy Week celebrations. Well, what makes it special is the world-famous Loboc Children’s Choir sings during the mass and the ritual. Amulet hunting is also a bizarre activity. It is a folk belief that anting-anting (amulets) are especially potent if collected, made, or charged on Good Friday. In Lamanok Point in Anda town and in Kalagan in Garcia-Hernandez, some albularyo search for anting-anting in caves and forests. The Church said Holy Week was supposed to be a time “to be with God” in silent prayer and reflection. 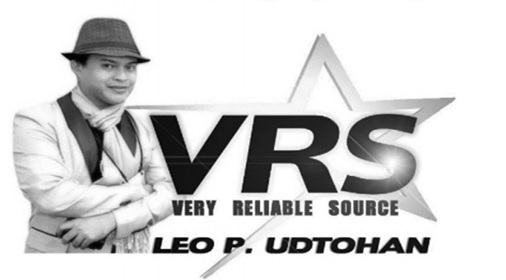 VRS has picked some places to make your activities meaningful. Old churches- There are many old churches for Visita Iglesia. Although some churches in Bohol were destroyed by the strong earthquake in 2013, they still provide space for meditation and prayer during Holy Week for your spiritual journey. There are 14 churches to visit in remembrance of the 14 Stations of the Cross. Mediate and pray at Alburquerque (Sta. 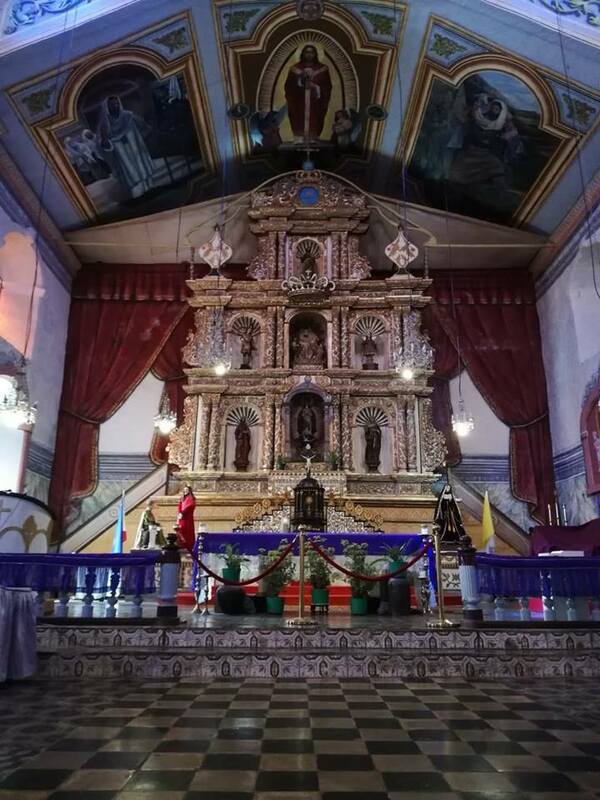 Monica Parish), Anda (Sto Nino Parish), Alicia (San Joaquin), Antequera (The Nuestra Señora del Rosario), Baclayon (The Church of Our Lady of the Immaculate Conception), Balilihan (Nuestra Señora del Carmen Parish), Calape (San Vicente Ferrer), Candijay (Saint Joseph),Corella (Parish of Our Lady of the Village), Cortes (Santo Niño Parish), Dauis (Church of Our Lady of the Assumption), Dimiao (San Nicolas Tolentino Parish), Duero (Immaculate Conception), Garcia Hernandez (St. John the Baptist), Getafe (Santo Niño), Guindulman (Nuestra Señora de la Consolacion), Inabanga (San Pablo Apostol), Jagna (San Miguel Arcángel Parish), Lila (Virgin of the Holy Rosary), Loay (Santissima Trinidad Parish), Loboc (Church of San Pedro), Loon (Church of Our Lady of Light), Maribojoc (Santa Cruz Parish), Panglao (San Agustin Parish), Tagbilaran City (Cathedral of San José), Talibon (Most Holy Trinity), and Valencia (Santo Niño Parish). Fatima Rosary Hill- The shrine of the Madonna of the Miraculous Blessed Virgin Mary in barangay Buenavista in Carmen town was built sometime in the early 1940s. There is a concrete chapel, a spring and a souvenir shop. Spiritual recollection becomes more enhancing on top of this hill where one can look at the wide plains of Carmen and Sierra-Bullones. Don’t forget that it is holy and quiet. Burn a candle and pray. San Antonio de Padua Shrine- Located in Barangay Tinibgan in Calape town, it houses the miraculous image of St. Anthony of Padua, one of the Catholic Church’s most popular saints. Saint Anthony of Padua is the patron saint of lost and stolen articles. Village of the Compassionate God the Father- The shrine located in Barangay Fatima in Inabanga town provides a unique place for quiet, restful, meditative prayer during the remembrance of the final days before Jesus’ death and resurrection. 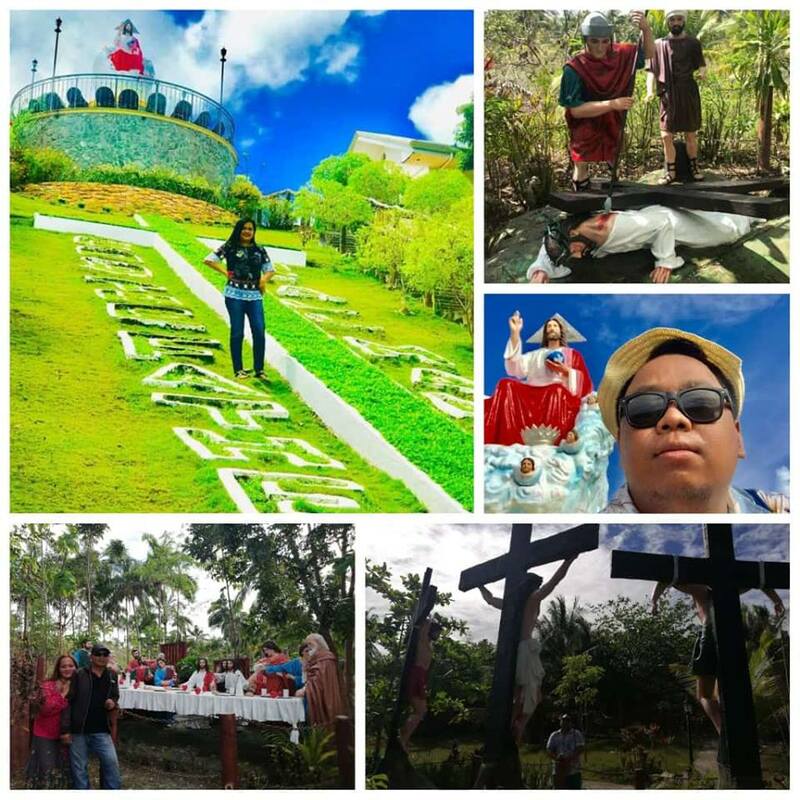 There are life-size structures of the 14 Stations of the Cross with a big figure of the God the Father of All Mankind at the top of the hill. “When I am in doubt, troubled or feeling blessed, I always come to this place to find serenity..and for thanksgiving,” said call center agent Gerwin Yudelmo, a frequent visitor of this pilgrimage site. Krus Daku and the Statue of Our Lady of Guadalupe in Loboc – It is one of the favorite destinations of the pilgrims during the Holy Week. A huge white cross 80 feet in height is on top of the highest hill. In the next hill, one can visit the giant image of the Our Lady of Guadalupe. Here, one can view the towns of Loay and Loboc. Virgen sa Kaluoy in Calape- The image of the Virgin is believed to be growing from an empty giant shell. From a mere obscure figure, the image now is very visible, showing the beautiful virgin with the giant shell in the background. Shrine of San Pedro Calungsod- A five-foot tall statue of Blessed Pedro Calungsod found in Barangay Malbog, Jagna town, is a popular pilgrimage site. The only statue dedicated to Pedro Calungsod in Bohol, tourists and pilgrims pray before the statue and leave written prayers at the foot of the statue.